Quests don't yet offer the personalized, narrative experience they could. Pop culture’s obsession with apocalyptic scenarios would have you believe that we take a pretty dim view of Earth’s future prospects. It’s on TV, it’s at the movies, it’s in our video games. All of these fictions seem to circle around the same, unspoken question: Have we passed a point of no return and done irrevocable damage to our future? Sid Meier’s Civilization: Beyond Earth puts forward the optimistic premise that we might get a do-over. 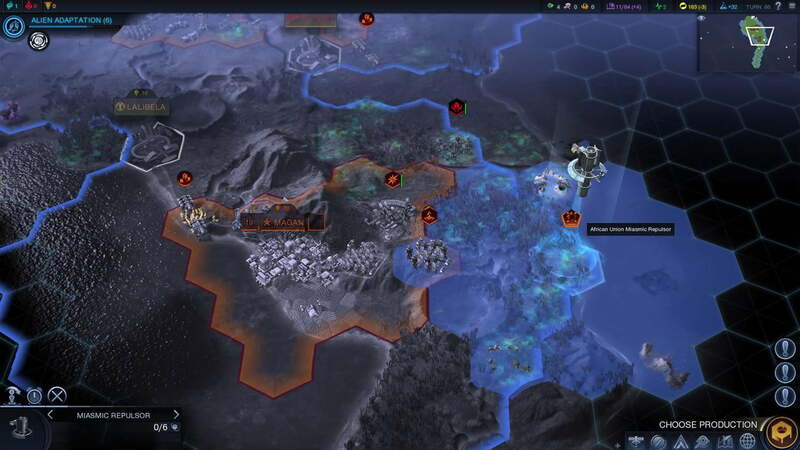 Following an unspecified cataclysm called “The Great Mistake,” the nations of the world came together with the goal of settling on distant worlds. You are tasked with leading one of these fledgling colonies to survive and then thrive in their new home, setting a course for humanity’s future that will hopefully avoid previous missteps. 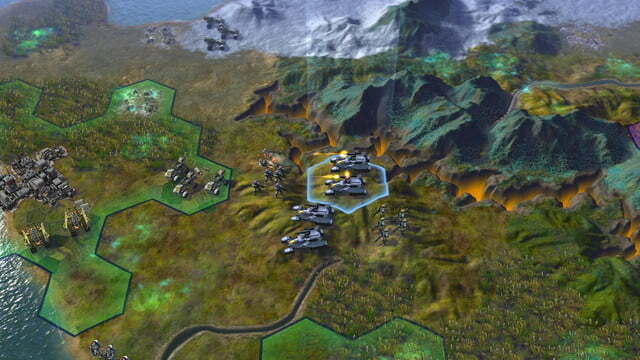 Civilization: Beyond Earth puts forward the optimistic premise that we might get a do-over. Right off the bat, setting up a new game in Beyond Earth is more involved process than we’ve seen in previous Civ games. You are first presented with a list of potential sponsors for your mission, similar to the standard civ/leader selection process. These entities correspond to various regions of the world (the Pan Asian Cooperative or African Union, for instance), and each – again, much like their historical counterparts – has a top-level ability that will shape your strategy. So far, so familiar. 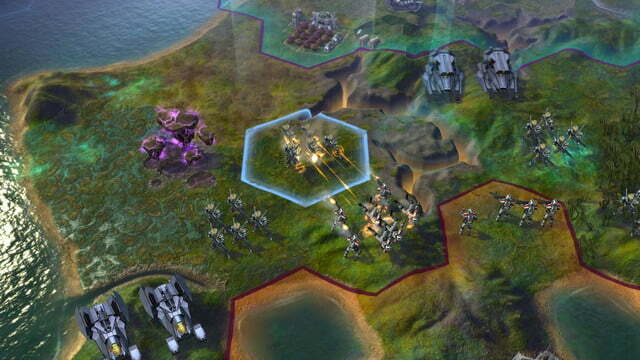 After that, though, you are presented with further choices: What sort of people you bring on the mission, with different specialists providing bonuses to your cities; the type of ship you take, which informs what you know of the colony planet and initial settlement location in advance; and what additional equipment or resources you bring, so you can start with early game units like a soldier or worker. These choices have a major impact on the opening turns, which can snowball into success or failure as time ticks on. The first few turns after landing look much like any game of Civ: Send your explorer to scout out the surrounding terrain and hope they won’t get jumped by the natives (alien wildlife in this case, replacing the barbarians of Civs past); have your worker build farms and mines to start ramping up your city’s engine of growth and productivity. If you’re familiar with the series then you know the drill. The differences start to set in when you first open the sprawling technology web to select a research path. 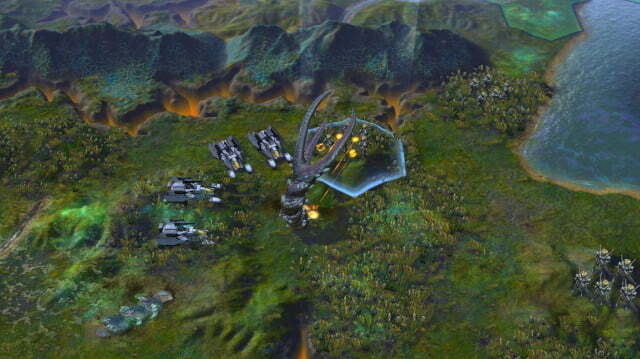 Beyond Earth splays its futuristic vision out in a radial web, with your colony’s progress creeping out from the center. Familiar notions such as Genetics and Computing soon give way to more foreign and exciting possibilities like Alien Hybridization and Synthetic Thought. This leads to a much more unpredictable course of research than previous entries in the series. Rather than simply choosing the order in which to follow the known course of human development, competing civilizations can take drastically different routes through the web. One nation could build an army of giant robots and orbital lasers while another rushes to terraform the planet with new resources while studying Alien Evolution to breed titanic, city-wrecking kaijus. 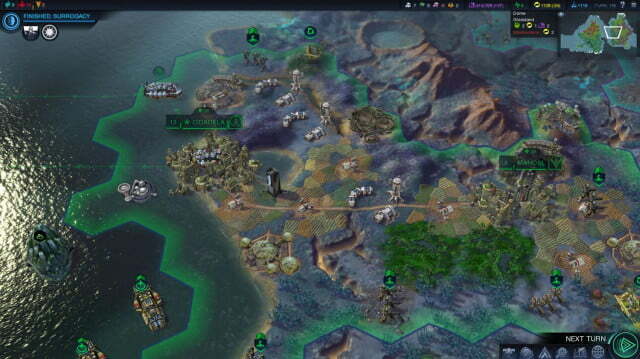 There’s no singular endgame point where everyone has access to the same tech; civs are defined by their differences. The radiating possibilities can be intimidating at first, leading to a sense of aimlessness as you haphazardly meander through unfamiliar names like Swarm Intelligence and Euthenics. As you become familiar with the immediate possibilities, though, that confusion gradually fades into a sense of discovery. The Wonders in particular do a good job of breeding curiosity. 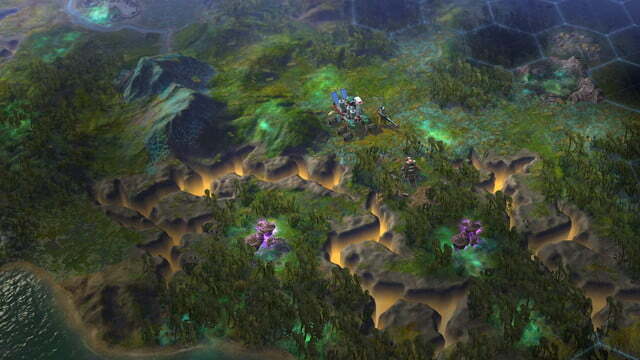 The Kavithan Protectorate has built the Promethean? What even is the Promethean? 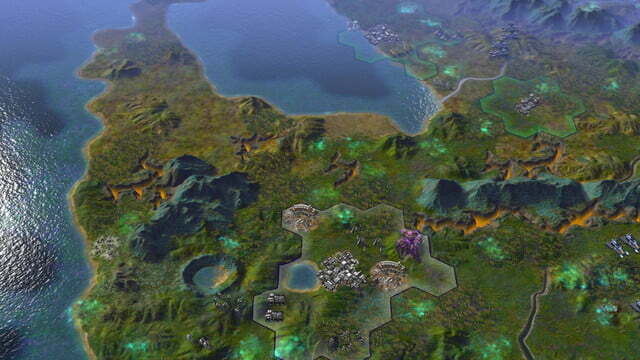 Civilization: Beyond Earth takes the best that Civ V had to offer and liberates it from the baggage of history repeating. Affinities provide another level of order to the open possibilities of the tech web. 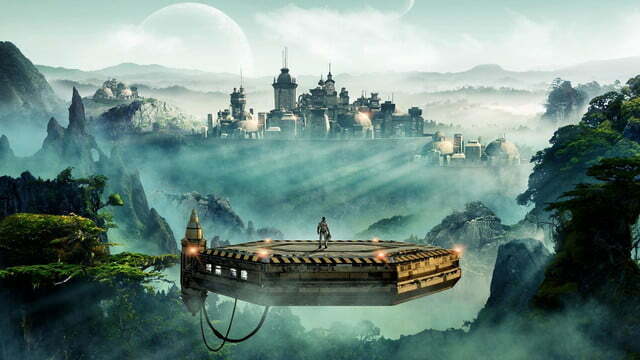 They’re analogous to the Ideologies of Civ V, but tied to technology rather than culture: Harmony embraces oneness with this new world, Supremacy seeks to conquer it, and Purity craves a return to the old ways of Earth. 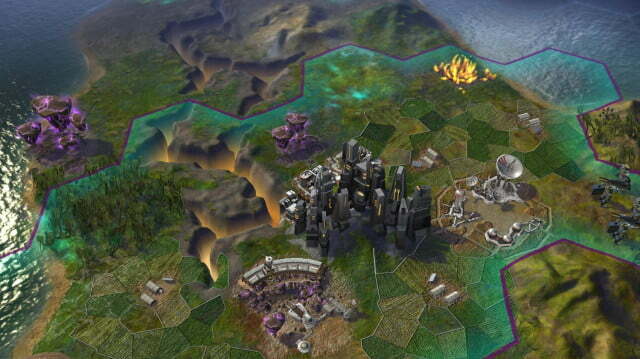 Certain techs, once researched, apply points toward specific Affinities, and that in turn defines the ideological stance of your civilization and informs certain unique victory conditions. Progressing in each Affinity unlocks powerful bonuses like maintenance-free roads or the ability to call down a terrifying siege worm against enemy cities. Affinity levels also upgrade and specialize your military units, changing their name, appearance, and abilities depending on where your ideologies lie. It is extremely gratifying to see your nimble but weak Rover evolve over the course of the game into a sleek, hovering Viper. The artificial intelligence of non-player civilizations is unfortunately one of the blemishes from Civ V that Beyond Earth inherited. Foreign leaders are still petulant children who always ask for far more than they are ever willing to give, scheming relentlessly and erratically. The Affinities add a degree of predictability as to who will get along with whom – shared ideologies make for shared goals, after all – but in general your virtual counterparts can be obtuse and frustrating to deal with. 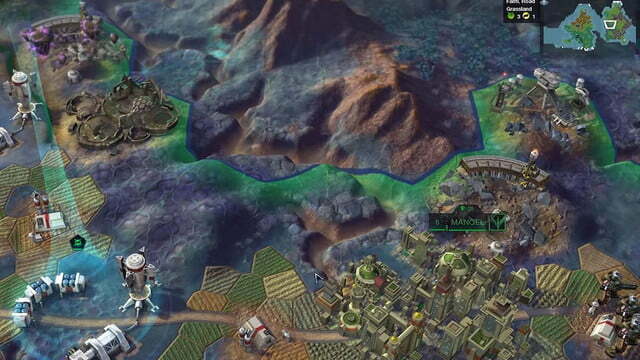 City-States of previous Civs are back as well, in the form of Outposts, but they’ve been disappointingly simplified. 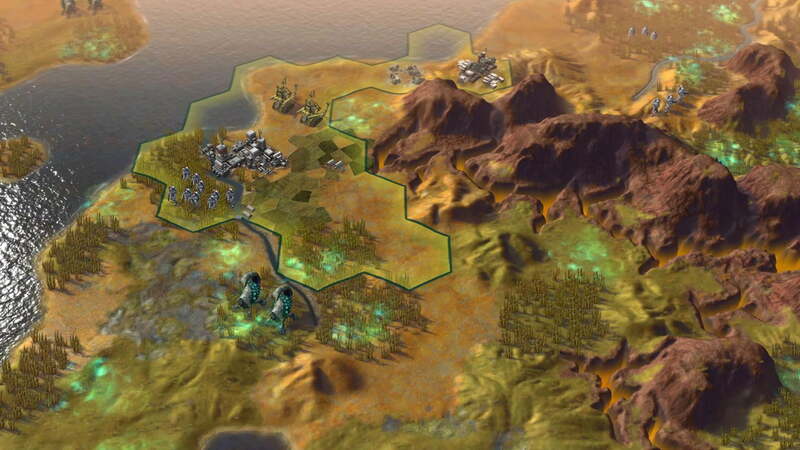 These independent factions that aren’t quite large enough to qualify as civs themselves exist largely as agents with whom you can establish trade routes. The occasional quest will ask you to destroy one on behalf of another, but they are otherwise lacking in personality or mechanical crunch. 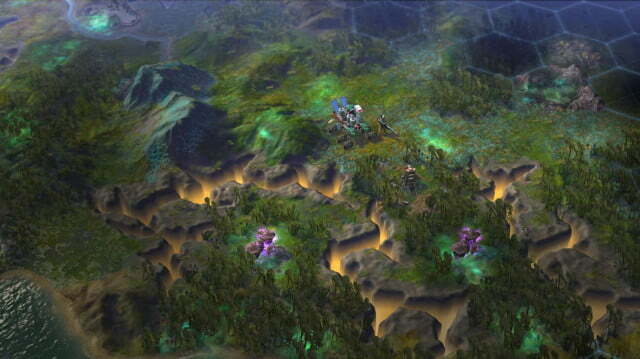 Those quests are a new system in Beyond Earth, providing some narrative color and subtly guiding your growth. They come in the form of text boxes that occasionally spring to offer you a choice. Do you harness the Thorium Reactor’s excess output for more raw energy or greater production? Do you welcome the machine-augmented people that crashed nearby into your society, or cast them out to find their own way? 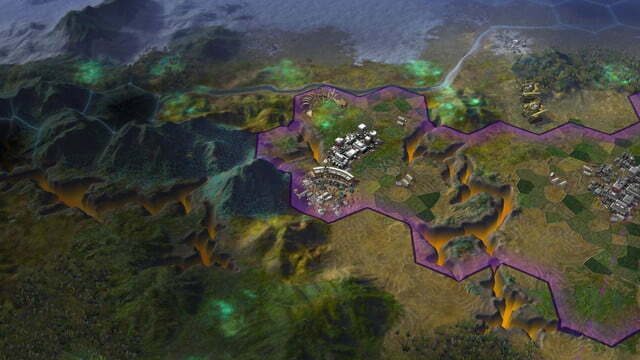 Your choices can impact Affinity levels and reward you with units, culture, and upgrades to your buildings. The added customization of building-triggered quests is a welcome touch that gives you finer control over your civilization’s development. However, it quickly becomes apparent over multiple playthroughs that the body of quests is disappointingly small. The game would be greatly served by a larger variety of quests in future updates, enough to really infuse each playthrough with its own unique spin. 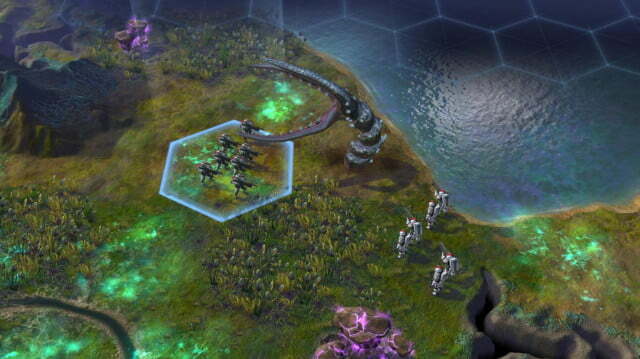 The aliens of Beyond Earth are both more and less menacing than the barbarians of games past. 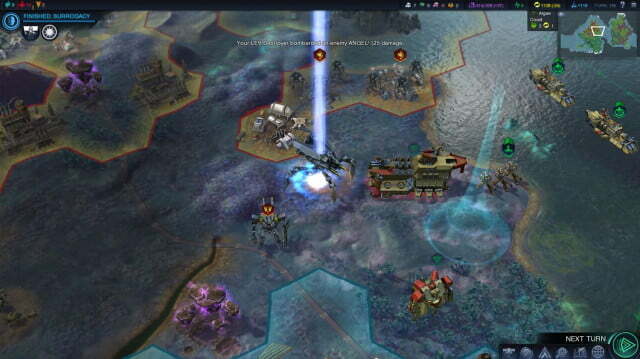 They are a far deadlier threat in the early turns, slowing expansion until you can properly secure your territory. Simultaneously, it’s also possible to ignore them or simply wipe them out. Unprovoked, the aliens tend to leave you alone. If you send a hapless explorer into the midst of an alien swarm, they will probably kill it, but there won’t be serious incursions into your territory unless you (or one of your neighbors) really starts to piss them off. 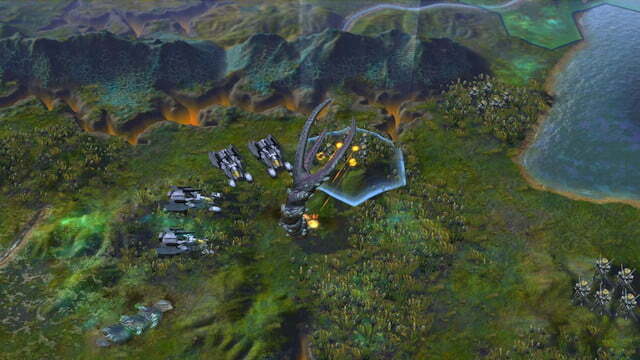 The alien threat level ranges from docile green to enraged red, based on how the local humans treat them This ties back to Affinities and inter-civ relationships as well; a Harmony-oriented colony might seek peaceful co-existence with local wildlife while a neighboring Supremacy civ works to wipe them out. The result of these interlocked systems is a far more dynamic relationship than the nuisance of past games’ barbarians provided. Superficially, Beyond Earth is as stunning as fans have come to expect from developer Firaxis. The world, buildings, and units are all designed with loving attention to detail. Unbounded by history, the writers have been given a chance to shine in the fantastic flavor quotes that accompany new technologies and Wonders. The reams of text filling the Civilopedia for every element of the game show the incredible thoughtfulness and intelligence that went into each choice. The music also stands out, establishing from the main menu a haunting air of menace that sets the game’s tone. This is not a leisurely meander through known history, but a dangerous trek into the unknown. 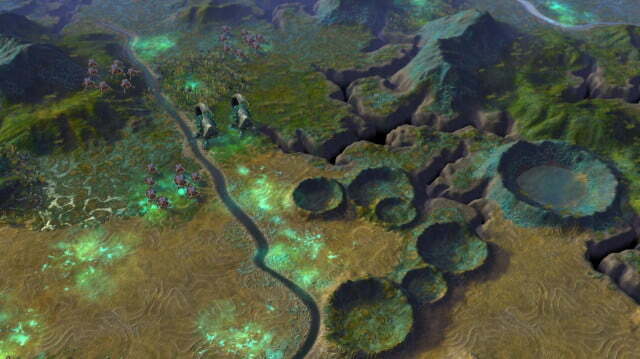 The alien threat and choking miasma that floods the map on your arrival makes establishing a toehold seem like a bleak and harrowing prospect. This slower beginning makes it all the more satisfying when you do manage to achieve momentum and take control of your own fate in the later game. While not without blemishes, the team at Firaxis has delivered an extremely solid, balanced, and enjoyable framework that will no doubt only grow stronger in subsequent expansions. 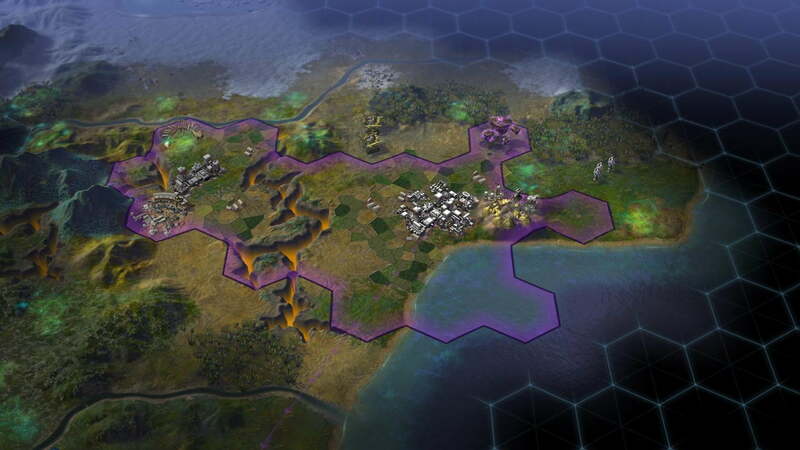 Civilization: Beyond Earth takes the best that Civ V had to offer after three years of post-release development and liberates it from the baggage of history repeating. The resulting game has been stripped down a bit, but starts out already much stronger than its predecessor was when it launched. 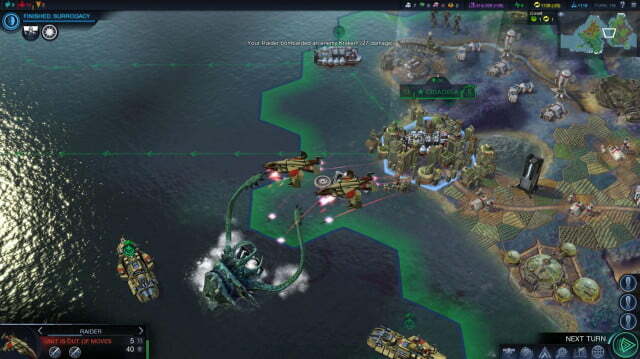 It is neither a radical departure nor a conservative re-skin, but by making excellent use of the tools that had already been developed, the developers have created a savvy companion piece that can sit confidently alongside Civ V in your library as an invigorating alternative. Quests don’t yet offer the personalized, narrative experience they could.